Jugo Juice Smoothie franchise business opportunity. 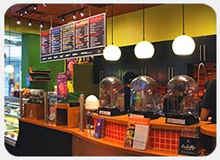 Free Jugo Juice Smoothie business franchise information. In the summer of 1995, our founders, Derek Brock and Jason Cunningham, were working as managers with a beverage company that was really starting to take off (Starbucks--you may have heard of it). They were very excited about how consumers responded so enthusiastically (to say the least!) to the idea of premium take on an “old” product--coffee. They wanted to repeat that success in their own business. With the coffee space already crowded, they brain-stormed what would be the next beverage to capture the public’s imagination. Smoothies were gaining popularity at that time but no one was offering a truly premium product and brand experience. They created Jugo Juice to fill that niche; they would be the leader in premium smoothies. If one of the greatest business successes of the last 50 years could be built on beans then why not fruit? Why shouldn’t your coffee break be your best meal of the day? A healthy idea that’s also a great business idea. Why do we feel Jugo Juice will enjoy a strong future? The answer lies in the fact that people are consuming highly processed and unnatural foods at an alarming rate. The result is an epidemic of obesity and health problems. If we want to help people avoid life-threatening health problems we must provide education and positive food choices. Consumers will focus more on health in the next 20 years like never before. We are happy that Jugo is a leader in defining the future of the healthy food and healthy lifestyle relationship - and this is why we are confident that the Jugo Juice brand has a Healthy Future as a business. We opened our first Jugo Juice location in December 1998 in Calgary’s [Canada] Eau Claire Market. 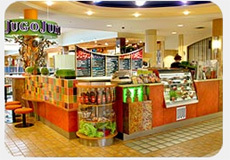 Since franchising its business in 2002, Jugo Juice has grown to a flourishing chain of stores across North America. Jugo Juice is leading the way in today’s world of fast food with the simple belief that natural unprocessed foods is what the future holds for healthy living. Jugo Juice takes great pride in the team of talented Franchise Partners we have across the country. If you are passionate about creating an environment that drives you personally, if you love to inspire those around you, and if you are seeking a business that will cater to the healthy needs of consumers today and in the future, you and Jugo Juice could be the perfect blend. To learn more about the Jugo Juice Smoothie franchise opportunity, simply complete the form below.